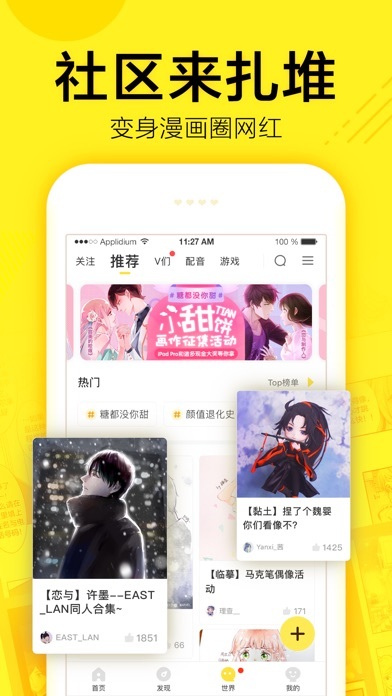 IOS App Developer: Kuaikan World (Beijing) Technology CO., LTD.
Kuaikan Comic is an amazing app which has the most entire comics and the best user experience. Super fast update on speed, provide the latest spiritual sustenance to you; High-definition and full-color comics let you enjoy the visual feast. Super comfortable bar layout makes you read easier even in crowded subway. 【The app features 】 Two weeks get millions of users. 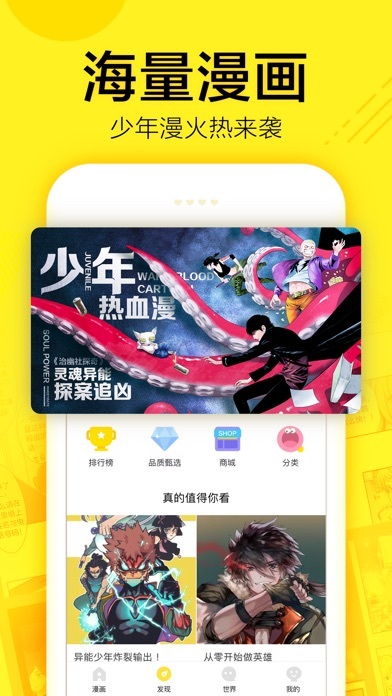 When Kuaikan Comic show on appstore,it has been launched，It had quickly consecutive AppStore free ranking the first three days, at the same time appeared out of the APP Store list for many times. 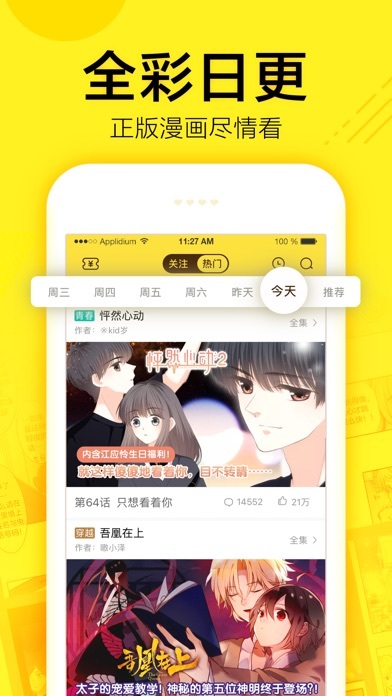 Within only 2 weeks, Kuaikan Comic APP captured more than millions users. Daily updates Every day we pick ten awesome short comics, and every have surprise! Let the leisure time be with you! 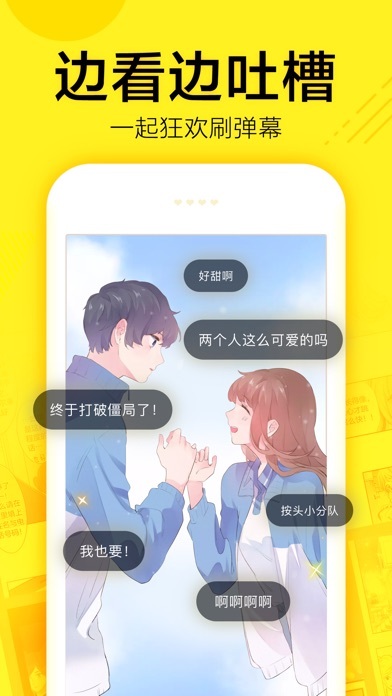 More than 100 million people are chasing the exclusive original comics look at "high school revenge ""cosmetic game" zero idol "unrequited love" against "and so on. 3.The domestic first completely adaptation of mobile phone reading comics APP Without horizontal screen, zoom in, you just need to slide ! Enjoy the typesetting effect completely adapted mobile phone comics! A diffuse type reading reading layout changed the traditional domestic mobile phones, let users read comic more comfortably! 4.New community, New world, everyone can post You can also post on the “Kuaikan World", and there are more interesting groups you can join in. Chat with each other when you have the same frequency and hobbies. Post、 Interact、Original amazing reply, won the "best of all" title. What are you waiting for, BIU～ 5.Achievement (1) Kuaikan Comic had been reported by a CCTV program named "Economy and half hours" in January 2015; (2) Kuaikan comic has awarded the 12th China comic Jinlong Prize "the most powerful original team" in September, 2015. 6. Kuaikan membership Kuaikan membership is available to purchase inside the APP in 3 ways - 15 RMB per month with auto-renew - 43 RMB per 3 months with auto-renew - 168 RMB per 12 months with auto-renew Purchase Notes - The subscription fee is charged to your iTunes account at confirmation of purchase. Subscription automatically renews and related fund will be charged 24-hours prior to the due date of current membership. - Auto-renewal subscription shall be turned off at least 24-hours before the due date of current membership if unneeded. - No cancellation or refund of the current subscription is allowed within the valid subscription period. - Subscriptions may be managed by the user and auto-renewal may be turned off within the user's Account Settings after purchase. I gave 3 stars since the apps is so good and there are so many interesting Chinese comics to read. But it’s so bad that I can buy chapters with iTunes payment. Please help me out with this and I will give 5 stars. I have so many things to read and I can’t cause I can’t buy the chapter. That’s too bad. So far I like this app, but the problems is I don’t really understand. It says it’s in English and Chinese which I know both, but I rather read in English. I never rate any apps but this app is too good and sooo fun to read! Is there an English version? If there's how should I turn it to an English? Tried it on both cell & iPad. Very frustrating. More IOS Apps by Kuaikan World (Beijing) Technology CO., LTD.